A military tattoo is not what you’re thinking…unless you’re thinking of a huge show featuring military bands…then it IS what you’re thinking. It’s not our typical date night, but I was looking forward to the Netherlands National Tattoo 2014 in part because I wanted to see a band on bicycles. Yes, seriously. They enter in the dark. Small lights shining in rows. And BAM! There they are, playing their instruments one-handed, moving in formation, and even repairing a flat (staged) mid-show. I played mallets (e.g. xylophone, marimba, etc.) in high school, so my favorite rider was the guy with a vertical set of bells attached to the front of his bike. My smile was a mile wide. But this wasn’t the highlight of the show. From the NL Corps National Reserve, Marine Buglers Corp, the robust sound of the Belgian unit, to the NL Police steel-drum band, this was a great show. Oman’s Royal Police Band was the best in marching formations, and the choreography of 6 horses and 6 motorcycles from the Gendarmerie Corps made folks gasp. Still, it wasn’t the best part. The seated orchestra would not be out-done. So their saxophone soloist “parachuted” in from the rafters while playing. He was lowered right into his chair, though his airborne uniform didn’t match the dress of his other band mates. Not long after, it looked for a moment like Les Miserables was getting ready to start, but it was a re-enactment set to music of the landing of Wilem I in his Netherlands kingdom 200 Years ago. The finale with bikes far left and New Guard America front left. More responses of awe were inspired by the New Guard America rifle drill team than any other performing group. According to their webpage, “There are currently 13 World Records recorded by Guinness in the category of Rifle Exhibition Drill. New Guard America holds them all.” Needless to say, it was a thrill to watch them work with their bayoneted rifles. We were privileged to meet their leader, Constantine Wilson. However, the highlight of the show was the performance of one musician on one instrument. Trumpet virtuoso Eric Vloeimans stole the show. My date, who played the trumpet in high school, said, “I didn’t even know a trumpet could do that.” We were both stunned. I can’t think of a time outside of church when music moved me so. I searched on YouTube for some comparable piece to share with you and couldn’t find it. If you have a few minutes though, try Vloeimans’ “Requiem”. Kristin King is an author who recently relocated to The Netherlands (which includes Holland). 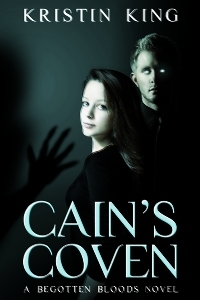 Her top sellers are “Unsinkable Vampire” and “Cain’s Coven,” and her latest novel in the Begotten Bloods Series is Death Taint. Kristen, hope Holland is treating you well..